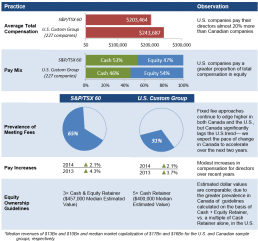 Annual analysis of outside director compensation among S&P/TSX 60 index companies found that average total compensation for directors increased by +2.1% last year. 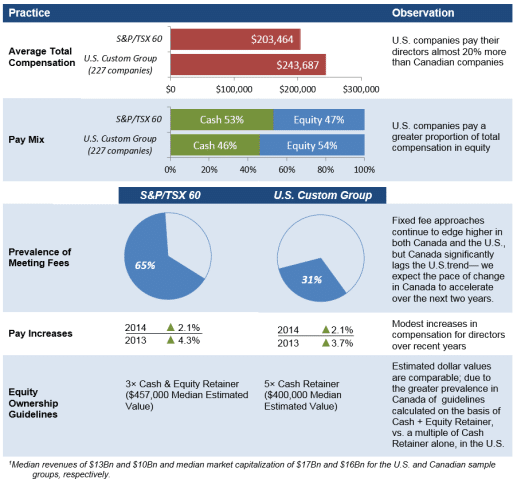 Meridian Compensation Partners’ annual analysis of outside director compensation among S&P/TSX 60 index companies found that average total compensation for directors increased by +2.1% last year. 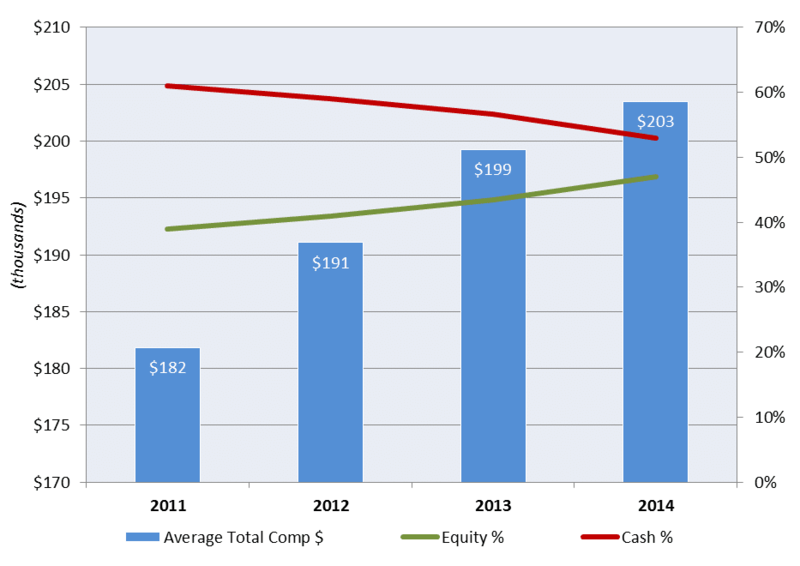 The proportion of total compensation delivered in equity has increased to 47%, up from 43% the year before. 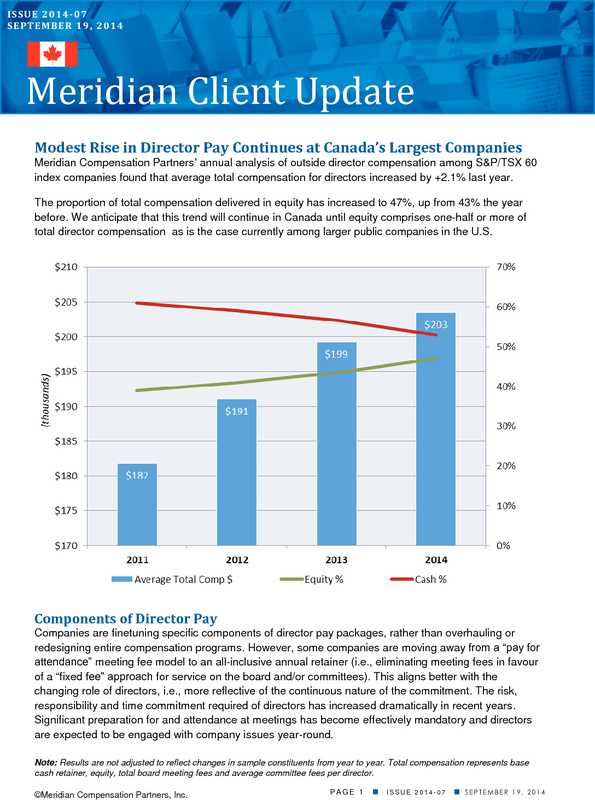 We anticipate that this trend will continue in Canada until equity comprises one-half or more of total director compensation as is the case currently among larger public companies in the U.S.
Companies are finetuning specific components of director pay packages, rather than overhauling or redesigning entire compensation programs. 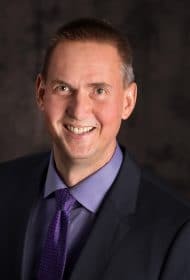 However, some companies are moving away from a “pay for attendance” meeting fee model to an all-inclusive annual retainer (i.e., eliminating meeting fees in favour of a “fixed fee” approach for service on the board and/or committees). This aligns better with the changing role of directors, i.e., more reflective of the continuous nature of the commitment. The risk, responsibility and time commitment required of directors has increased dramatically in recent years. Significant preparation for and attendance at meetings has become effectively mandatory and directors are expected to be engaged with company issues year-round. The median value of share ownership requirements increased to about $457,000, up from $420,000, while the median multiple remained at 3× annual retainer. Prescribed multiples range from 2× to 10×. The prevalence of board meeting fees continues to decline year over year. However, the pace of change remains slow, with 65% of S&P/TSX 60 companies still paying per- meeting fees this past year, down from 67% the year before, and a fall of only 8 percentage points since 2011. This differs notably from the U.S. and U.K., which have experienced a more pronounced shift, and now have only a small minority of companies paying meeting fees. Meridian comment: We expect the pace of change to an all-inclusive retainer to accelerate in Canada over the next two years.